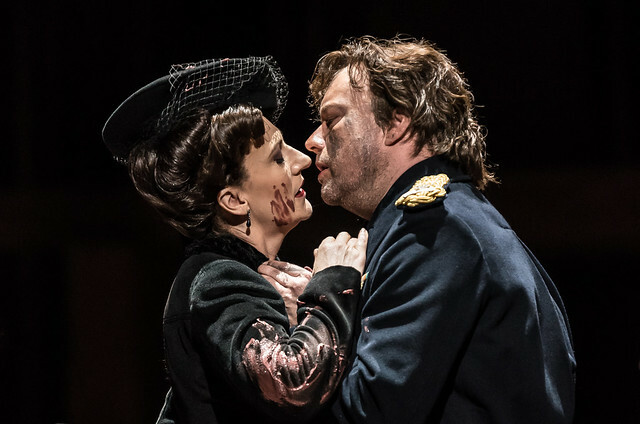 What did you think of Àlex Ollé and Valentina Carrasco's Royal Opera production of Enescu's masterpiece? #ROHoedipe #premiere: Beautiful score and performance @TheRoyalOpera last night. Congratulations to the creative team! Loved #ROHOedipe. A memorable production with striking images, and a writhing, exotic score superbly sung by principals and chorus alike. Wanted to like Oedipe. Did my homework, but not wowed by #ROHOedipe. Good production, but too dimly lit &, to my ears, vocally underpowered. Many congratulations to @conductorleo on his @RoyalOperaHouse debut. Anyone would have thought #ROHoedipe were a staple of the repertory. #ROHoedipe @TheRoyalOpera I have waited 25 years to see this opera. Magnificent production and wonderful performance. Overwhelmed again! Supreme singing & playing in #ROHoedipe - really brings home what a riveting, vital score this is. Congrats all! #ROHoedipe what @TheRoyalOpera should be doing ALL THE TIME! Profound, compelling, intelligent music drama showcasing ensemble excellence. What did you think of Oedipe? 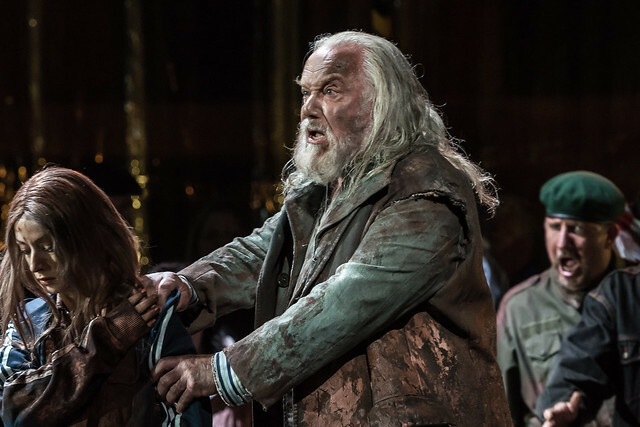 Oedipe runs until 8 June 2016. Tickets are still available. I really enjoyed last night's performance. The work is very much in the same idiom as last season's King Roger though a bit more long winded. Singing was excellent, especially the Sphinx. Production had many fine moments aside from the muddled roadworks scene. So pleased to have had the opportunity of seeing this work. Ticket prices were fantastic value. Thank you. One of the tweeters, the experienced Mark Berry, sent out what he meant as a positive message: "I feel almost as when first discovering Busoni or Szymanowski". That could however also be a warning: I for one found this heavy going. 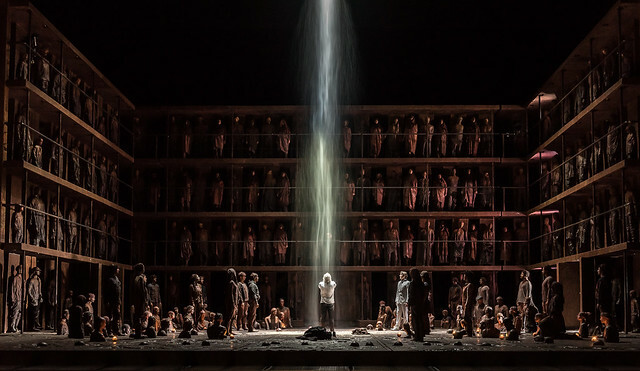 Very glad I saw it and the work – more of an oratorio than an opera? – is worth producing, but I found myself rather underwhelmed. The orchestral playing, singing and acting were faultless; my problem was with the music. The last act is magnificent and the all too brief Sphinx scene –– is musically thrilling, with the musical saw’s dying fall, yet mostly the music’s mix of romanticism and modernism never gelled or held my interest: it chuntered along inoffensively and undramatically, occasionally loud then quiet again for dramatic effect. Rather like the production. I’ve always thought that, as visually impressive as they undoubtedly are, La Fura dels Baus are more style than substance, and, here, I didn’t get the link with ‘ecological disasters’ or climate change or much else really, and many of the visual tropes seemed a little worn. I did get that Oedipe exists outside time, is transhistorical, but did the Sphinx need to be in a disused fighter jet, in pilot’s goggles and gloves, to tell me this? Still, very pleased I saw it & it was tremendous value for money. A revelation ! sumptuous score, by turns terrifying, poignant and thrilling; an opera that oddly , somehow affirms life and its vicissitudes . Orchestra on top form and the chorus never better. Let's have it again soon ! Loved the Production. First class singing of an opera and superb playing by the orchestra of this remarkable score. This opera deserves to be put on by many more opera houses. Congratulations to ROH for putting this on stage. As a newcomer to this opera I enjoyed the performances very much and the inventiveness of the sets. The reason for some of the staging choices were abstruse to me (shame the Insight event wasn't live streamed as this may have aided my understanding). The production is rather like a Sphinx riddle itself, it demands the audience do a fair bit of work. All in all a worthwhile artistic endeavour and glad for the opportunity to experience it but fear it won't be one I'll be revisiting soon. Saw Oedipe last night and, apart from the Sphinx, found it to be wonderful in every respect. A gripping and unusual production kept one's attention throughout while musically it was a joy. Well done ROH - more like this please. Tremendous, splendid - still thinking about it - and the visuals were amazing! A real treat! Finally, I experienced this opera last night and I was really impressed by the opera from the beginning to the end. Although I am not a big fan of Mr Holten, I would like to send my thanks for him to bring this marvelous stage with the fine singers to London. The story of the opera is also quite intriguing. It may not be appropriate to bring political issues here, but, in particular, the tension between Oedepie and Creon with the people in act 3 reminds me of the intolerant tone in the heated debate about Brexit. Thank you ROH for this. What a marvellous musical experience this was, the orchestra were so good, the chorus tremendous and the all the singers greta especially Johan Reuter. I took my 14 yr old grandson with me. It was his first experience of opera and he is a proper lad. He was not phased a bit, sank into it and really enjoyed it. The production was amazing, lights design everything great. The final scene was mesmerising truly fine. I wondered if this production had been visually recorded. So good. Thanks.Have a kiss x. Thank you, Royal Opera! Thank you, Kaspar Holten! Thank you, Leo Hussain, Johan Reuter, all the singers, the directors and technical staff, the magnificent orchestra for finally bringing in this masterpiece to London. Now let's revive it - in perhaps 10-15 years. I enjoyed Oedipe very much. Went to the insight beforehand. I saw it 3 times, the singing and music excellent. I only wish I could have phoned the ROH shop next day and ordered the DVD of this production.